An American Buddhist friend’s very old father became suddenly very ill, and he expects a heavy time. This is part of my sutra for him. AA is for recovering drunks who are trying to stay sober by not drinking and following a prescribed set of steps. The Sangha is exactly the same – we on the Buddhist path are just like drunks, except we get drunk on our thoughts instead of alcohol. We know how not to do this, but it is hard to stay sober, so we get tempted, or overwhelmed, and find ourselves on a barstool, and sometimes we find ourselves drinking again, or even drunk. Often, in fact. In AA when a drunk finds himself in trouble like that, he calls his sponsor, who reminds him what’s going on, tells him not to drink (which he knows anyway, but needs to hear), and reminds him to work the steps, perhaps suggesting a particular step of the 12 that would be especially useful at the moment. The drunk is willing to be helped, and to help other drunks, because we all need help to stay sober, and Bill Wilson (the Founder and author of the Big Book) had the foresight to establish the sponsorship structure as a source of help for drunks working the steps. Our Founder established the Sangha for a very similar purpose, and told us to take refuge in it. SO: as you enter a period where your thoughts can be expected to be very turbulent, be especially mindful and cautious, and keep working the steps, and don’t let yourself get swept up. And if you need to, call your Sangha-buddy (me), as a drunk would call his sponsor. That’s what the Sangha is for – to take refuge in. And while we’re on the subject of refuge, that’s what the Dharma is for too – to take refuge in. Just as the drunk knows that Thanksgiving with his ex-wife (for the children) will be stressful, with people drinking alcohol all around, you know in advance that your thoughts and emotions will roil during the coming ordeal. So rather than expect to get swept away, and then to climb back gasping onto the boat afterwards, instead batten down your hatches, tie on your life jacket, clip your lifeline to the railing, and be prepared to ride it out using your knowledge and hard-won wisdom and patient working of the steps. That storm is going to be in your head. Remember that when it starts blowing. The Dharma is not there to protect your father from death, but to protect you from the associated suffering. Here’s a mantra for you: the motto of the City of Paris. The arms of Paris (left) are a boat on the water (derived from the 13th century seal of a guild of Seine fishermen). 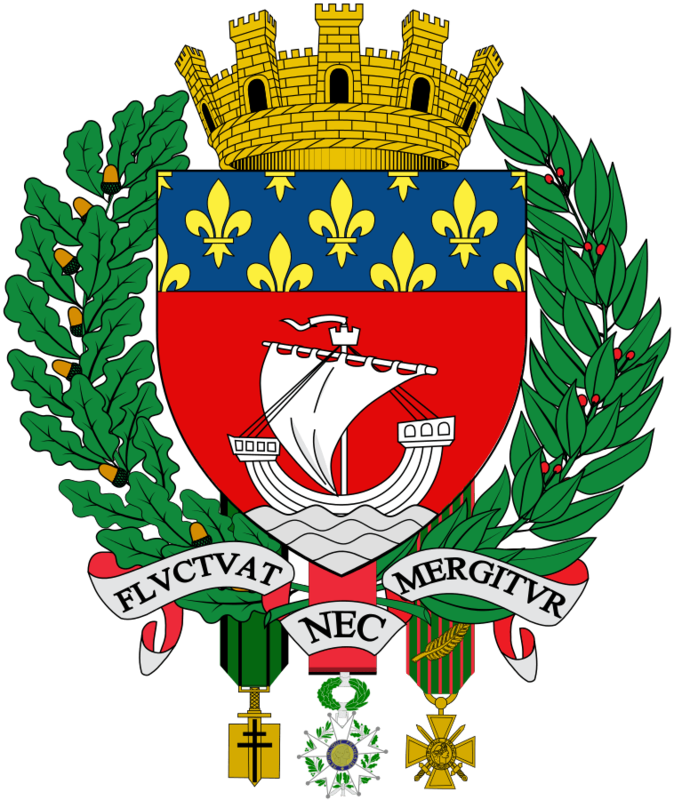 The motto refers to the boat: FLUCTUAT NEC MERGITUR. This means, roughly, she is tossed by the waves, but does not sink. I find it a very helpful mantra for rough weather.